The subjects of the offerings at the Epiphany, with the accompanying legend of the Three Kings or Magi, and that of carol singing, require so much space that it has been thought preferable to devote particular chapters to them, rather than interrupt the narrative of Christmas festivities. The king of the bean was the forerunner of our Twelfth- Day King in the Saturnalia a king was elected, and as some say by beans, by way of lot, and he was invested with full power over the guests, and from him the lord of Misrule, under his various names, may take his origin; but the king of the bean and Twelfth-Day king were strictly confined to Twelfth Day, and ephemeral in their rule. According to old legends, which are always fond of embellishment, this star was an eagle flying and beating the air with his wings, and had within it the form and likeness of a young child, and above him the sign of a cross. D’Israeli mentions some rays of this star, in a collection of relics. Myrrh, incense, gold, as to man, God, a king. Many of the ancient ecclesiastical writers endeavoured to find out mystical meanings in every sacred subject, in which, however, they have followers in the present day; so that the variety in appearance of the Three Kings may be supposed to have some reference to the three races of man, where, according to the Armenian tradition, Shem had the region of the tawny, Japhet that of the ruddy, and Ham that of the blacks. “Ces billets out touché aux trois têtes de S.S. Rois à Cologne. It was found in the purse of Jackson, a celebrated smuggler, convicted of murder, in 1749, but did not prove efficacious with him, as he died, struck with horror, just after being measured for his irons. Another charm is to write their names in virgin wax, with a cross against each, and place it under the head of one who has had any thing stolen from him, and he will dream of what has become of the stolen article.6 If he does not remember his dream, it must be his own fault, of course. The names of the Three Kings, together with those of the four shepherds, who went to our Lord in Bethlehem — Misael, Achael, Cyrianus, and Stephanus — (in the Chester mysteries they have the more humble names of Harvey, Tudd, and Hancken), form a charm against the bite of serpents, and other venomous reptiles and beasts.7 One John Aprilius, when he was hung, having implored their assistance, was more successful than Jackson; for, after having been suspended for three days, he was found to be alive, and being taken down, he went to Cologne, half naked, with the halter about his neck, to return thanks, and, probably, to request that next time he might be taken down a little sooner. One Roprecht, a robber, was hung for certain crimes against society, but his body disappeared from the gibbet, whether by the intervention of the Three Kings or not, was unknown. In a short time, however, it was found hanging again, with the addition of a pair of boots and Spurs. As he was now really dead, and could tell no tales, this freak of his absconding for a short time, for the purpose, apparently, of being hung over again in boots and spurs, could not be explained by the people but the fact was, that some passer-by had, in the first instance, found him still living, and compassionately maintained him for some time; but, like the warmed viper, he returned to his old knavish practices, and stole his benefactor’s horse, when, being pursued and taken, he was, after some trouble, replaced in his old noose, and left to his fate. According to Picart, the Feast of the Epiphany was established in the fourth century, though Brady says it was first made a separate feast in 813. It became, however, one of the most popular of the Christmas festivals, and some of the most splendid entertainments were given on this day; and in our times it is probably the most popular day throughout the Christmas, thanks to the Twelfth Cake, and drawing for characters, with other amusements. It was a very early custom to choose a Twelfth day king, or king of the bean, as he was formerly called; and this was originally a case of election, although afterwards, as at present, taken by lot; but, at the same time, the practice of election was also continued, even to recent times; the French court choosing one of the courtiers for king, who was then waited on by the other nobles, as late as the time of the revolution, when, amongst other vagaries, the ruling citizens, for the time being, changed “La fête de Rois,” to “La fête de Sans-culottes.” The students and citizens in the various cities and universities in Germany, also, used to choose one of their companions for king; and this practice would appear preferable to our practice of drawing for characters, and would probably ensure the election of the person best calculated to promote the wit and enjoyment of the evening, instead of taking the chance of the least adapted, or who may be called the “slowest” of the party drawing the lucky card. Even now, however, occasionally an election is made, and the fortunate elect then chooses his court for the evening. In the last century, the Twelfth Night cards represented ministers, maids of honour, and other attendants of a court, and the characters were to be supported throughout the night. At present they are in general grotesque, and seldom possess much wit or humour. Many early notices may be met with of the antiquity of the custom. In “Les Crieries de Paris,” of the thirteenth century, the “Gastel à fève orroiz” is mentioned, which is described as a cake, with a bean for the “Fête de Rois,”8 and we shall find a present given to the court minstrels on the Epiphany, in the name of the king of the bean, in the time of Edward the Third.9 Down to the time of the civil wars, the feast was observed with great splendour, not only at court, but at the Inns of Court, and the universities (where it was an old custom to choose the king by the bean in a cake), and in private mansions and houses. The lord mayor and aldermen, and the crafts of London also, used to go to St. Paul’s on Twelfth Day, to hear a sermon, which is mentioned as an old custom, in the early part of Elizabeth’s reign. The French twelfth-cake is still plain in appearance, containing a bean: it was composed, about 250 years since, of flour, honey, ginger and pepper; what it is made of now, Monsieur Verey can no doubt tell, if he will; they are however far exceeded in appearance by the rich frosted, almond pasted, festooned, bedizened, and carefully-ornamented cakes of the English pattern, gladdening the eyes of joyful holiday young people, and through them the hearts of their parents. The eager grouping of passers-by, to see the shop-windows crowded with these elegant productions of confectionary science, causes stoppages in our highways and thoroughfares, with reiterated “Move-ons” from our policemen. About twenty-five years ago there was one exhibited, said to weigh one ton, but it might have weighed any given number, being simply several large wedges of cake, all plastered together, at the top and sides, with one uniform coat of sugar-frost. Speaking from memory, and with a taste somewhat blunted to these enjoyments, the flavour was somewhat below the average, and curiosity was rewarded by ascertaining — to use a bad pun, which it is hoped may be excused—that it really was μεγα ήαπον (mega cakon). 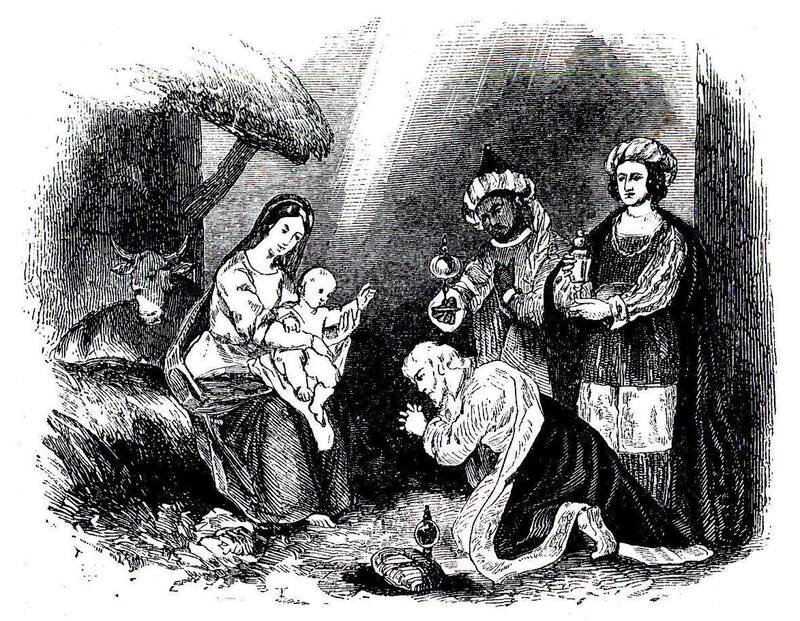 There are said indeed to have been representations in the French churches of the Three Magi as early as the fifth century; and there are French mysteries relating to them in the eleventh century, and also a Latin one mentioned by Lebeuf, wherein Virgil accompanies the kings on their journey; and at the end of the Adoration joins them very piously in the benedicamus. All this behelde I in picture on the wall." The offerings by our sovereigns of gold, frankincense, and myrrh, continued down to the present time, is referred to elsewhere in this work. Melchior was said to have presented a golden apple, formerly belonging to Alexander the Great, — made from the tribute of the world — and thirty pieces of gold. This legend is mentioned in the carol of the The Carnal and the Crane. In the hurry of the flight the Virgin Mary dropped these pieces of money and the other gifts. They were found by a shepherd, who kept them by him, and in after years, being afflicted by some disease incurable by mortal aid, applied to our Saviour, who healed him, and he then offered these gifts at the high altar. They were subsequently paid to Judas by the priests as the reward of his perfidy. There are two reasons given for his requiring thirty pieces of money: one that he considered he had lost thirty pieces by the box of precious ointment not having been sold for 300 pence, of which he would have purloined the tenth part and the other, that having been sent by our Saviour, on Holy Thursday, with this amount of money, to provide for the last supper, he fell asleep in the way and was robbed. In the midst of his distress the rich Jew, Pilate, met him, and he then agreed to betray his master for the amount he had lost. In one of our ancient chronicles there is a legend of the life of Judas, before he became an apostle, very similar, in many respects, to the well-known history of Œdipus, which need not be repeated here. When, smitten by remorse, he returned the money to the priests, and destroyed himself: they applied half in purchase of the potter’s field, and with the other half bribed the soldiers who guarded the sepulchre to say that the disciples came by night and stole the body of our Saviour. After this, having performed their mission, they were dispersed, and all traces of them lost. They were made of the purest gold, the term pieces of silver used in some parts of our translation with reference to them, being, according to the history, merely a common or generic name for money, like argent in French; on one side was a king’s head crowned, and on the other some unintelligible Chaldaic characters, and they were said to have been worth three forms each. There are many old manuscript histories14 of these kings in existence, at the Museum15 and elsewhere, one of which resolves the whole story into alchemy; and early printed histories, as by Güldenschaiff, in 1477, and Wynkyn de Worde, in the beginning of the sixteenth century. Some account of particularly splendid feasts on Twelfth Day have been mentioned in the foregoing pages. We did come before Herod’s door, he. Herod, the king, came himself before, &c.
Herod then spake with a false man’s heart, &c.
Why is the youngest of three so swart &c.
Aitho’ he is swart, be is well be known, &c.
In orient land he has a throne, &c.
We all came over the lofty hill, &c.
And there saw we the Star stand still, &c.
Oh, Star! you must not stand still so, &c.
But must with us to Bethlehem go, &c.
To Bethlehem, the lovely town, &c.
Where Mary and her child sit down, &c.
How small the child, and how great the good, &c.
A blessed New year that gives us God, &c.